July 12, 2018 / TheNewswire / Vancouver, Canada - Guyana Goldstrike Inc. (the "Company" or "Guyana Goldstrike") (TSXV: GYA, OTC: GYNAF, FSE:1ZT) is pleased to report a new discovery of gold mineralization at the Toucan Ridge area on its Marudi Gold Project ("Marudi" or the "Property") located in the Guiana Gold Belt, Guyana, South America. Locke Goldsmith M Sc. P Eng. 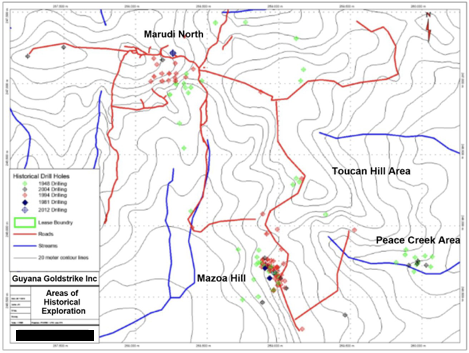 P Geo., VP Exploration states "It is very exciting that gold has been visually identified in trenching at Toucan Ridge and confirmed in assay results. The gold was discovered in quartzite-metachert, the host rock for mineralization at the Property. It's significant to note that gold discoveries in the host rock at surface are not common at Marudi. Historical drill data from the Property has shown that mineralization within the quartzite-metachert occurs predominantly at depth. Toucan Ridge is therefore very important as an exploration area and as a result it has been elevated in priority for further trenching." Marudi Property Mazoa Hill Resource Estimate Report G. Mosher M. Sc. P. Geo. The Company also announces that it has retained Integral Wealth Securities Ltd ("Integral") to provide market-making services in accordance with TSX Venture Exchange ("TSX.V") policies. Integral will trade shares of the Company on the TSX.V for the purposes of maintaining an orderly market and improving the liquidity of the Company's shares. Under the terms of their engagement, Integral will receive a cash fee of $5,500 per month. Integral will not receive shares or options as compensation. However, Integral and its clients may have or may acquire a direct interest in the securities of the Company in the course of their engagement. Guyana Goldstrike and Integral are unrelated and unaffiliated entities; Integral is a member of the Investment Industry Regulatory Organization of Canada ("IIROC") and can access all Canadian Stock Exchanges and Alternative Trading Systems. The capital and securities required for any trade undertaken by Integral as principal will be provided by Integral. The engagement of Integral is for an initial 12-month period, after which time it can be terminated on 30 days' notice. The Company is developing the Marudi Gold Project located in Guyana, South America. The project is unique in that it has an 18-year mining license in good standing, all-season road access, infrastructure in place, with an established mining camp serviced by employees, service buildings, and a full-time mining manager. The Property has three known gold bearing areas, specifically the alluvial areas, the saprolite, and the underlying hard-rock. The Republic of Guyana is located in South America and is next to the country of Suriname. Guyana is English speaking and under British Common Law with a democratically-elected government. It has an established mining act and a rich history of gold production. In 2016, 690,000 ounces of gold was produced by operators mining in the country. The Fraser Institute's 2016 Annual Survey of Mining listed Guyana as the third best mining jurisdiction with regards to investment attractiveness in the Latin America and Caribbean Basin sub-group. The Guiana Shield is the geographic gold-hosting region, and is world-recognized as a premier gold region that is highly prospective, under-explored and has geological continuity with West Africa. * In 2016, two mines in Guyana declared the commencement of commercial production: the Aurora deposit (Guyana Goldfields) and the Karouni deposit (Troy Resources).